Ben Stokes and Jos Buttler put European country in a promising position after a lot of top-order troubles on day one of the third check against West Indies. 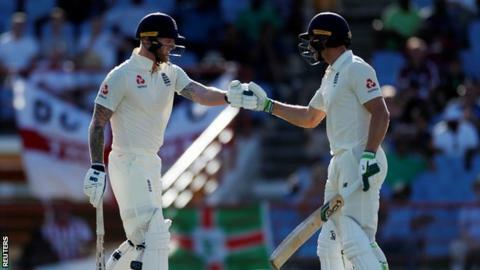 England fell to 69-3 but AN undefeated 62 from Stokes and sixty seven not out from Buttler saw them close on 231-4 in St Lucia. The pair placed on 124 - England's first century partnership of the series - as they dominated the evening session. Stokes was reprieved on 52 once he was caught and bowled by Alzarri Joseph however replays showed it was a no-ball. The England all-rounder had already left the sector by the time the decision was confirmed and unusually he had to come from the dressing room to resume his innings - solely allowable since a law modification in 2017. West Indies have already clinched the series, once crushing victories in the initial 2 Tests, but England's best batting show up to now in the Caribbean provides them an opportunity of setting up a consolation win.